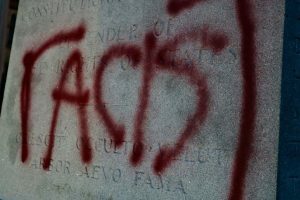 The Jefferson Davis statue has been vandalized again, this time with the word “racist” scrawled in red over the pedestal bearing the name of the former President of the Confederacy. 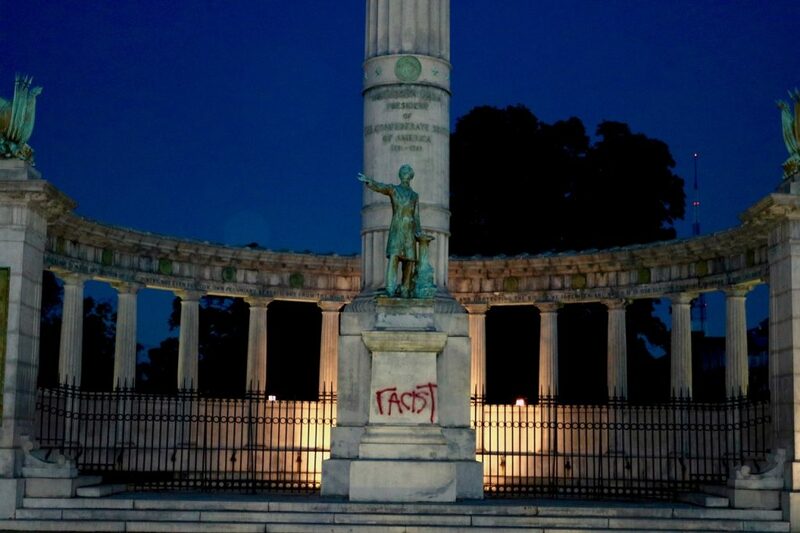 The statue has been vandalized at least three times since 2011, when someone painted “No Hero” on the base. In 2015, “Black Lives Matter” was written on the back of the monument. Police never made an arrest in that case, but they arrested another man, who pleaded guilty to painting an “L”, a second act of vandalism. Most recently, pine tar was dumped on the base of the J.E.B. Stuart statue this summer, following the neo-Nazi Unite the Right rally in Charlottesville. Richmond police have said that vandalism charges for these acts are usually considered felonies because the cost of clean up exceeds $1,000. 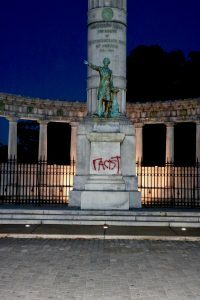 It seems likely that there will be more acts of vandalism after a tense summer that included Unite the Right, a neo-Confederate rally in Richmond (which cost the city more than $570,000 in preparation costs), and the postponement of the Monument Avenue Commission. At this time, the website for the Commission does not give a future meeting date, despite wide interest in discussing the statues shown at both City Hall and public safety meetings.